Borrowing its title from one fed-up newscaster’s furious declaration in “Network,” Andrew Napier’s “Mad as Hell” does indeed play like a real-life update of Sidney Lumet and Paddy Chayevsky’s skewering of TV news. Except that here the main personality is notably calmer, if no less passionate, and his personal story also touches on a larger and very significant one: the battle between old and new media and how it relates to journalists’ ability to “speak truth to power” in an age of all-pervasive corporate control. Nowhere in the film is its subject, Cenk Uygur, the founder and main mouthpiece of a YouTube show titled The Young Turks (TYT), called a journalist, but he does function as such, even if his game is commenting on the news rather than doing reportorial spadework. Being innocent of much television and online content, this reviewer had never heard of Uygur or TYT but found the film’s account of them engaging enough to leave him intrigued and impressed with both. Director Napier comes at his subject from an insider’s angle. After moving to Los Angeles a few years back, the aspiring filmmaker got a job at TYT and later proposed making a documentary about his boss to the man himself. Uygur agreed and promised Napier complete editorial control of the sort that guarantees his own, liberally employed freedom of expression. Thus began a five-year filmmaking odyssey that reached a dramatic climax of sorts when Uygur had encounters with the mainstream media that tested his principles and autonomy. Raised in a Turkish immigrant family, Uygur was aggressively opinionated from an early age, according to friends who, sometimes with quasi-pained expressions, recall his domineering ways in any and all discussions. From the first time he made it onto TV, he knew he wanted a career braying his thoughts at the public. So, after graduating from law school and quickly quitting the first cushy law job that came his way, he launched himself onto the airwaves via a public access channel in northern Virginia. The pay was zilch but the satisfactions, it seems, were formidable. From there he moved to Florida, where he proved to be a terrible on-air reporter, sweaty and obnoxious. Undeterred, he moved to L.A. and landed a Sirius radio show, where his opinion-mongering proved to be a good fit. To this point, Uygur’s beliefs made him another angry conservative/Republican shouter, a baby Beck or Limbaugh. However, after the U.S. invasion of Iraq and the resulting reports of American torturers, he jumped the ideological fence and became a liberal/progressive – without turning down the volume, of course. 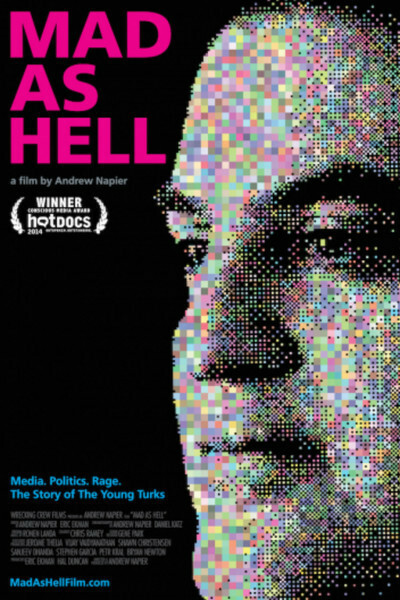 “Mad as Hell” does not spend much time on Uygur’s political views, either before or after his conversion, and that’s just as well: only a few soundbites will suffice to let most viewers know where he stands. His more important views concern the media. Offered lots of money just to appear on radio and avoid TV, he turned down the cash – one of numerous instances of “burning bridges,” which he claims as a specialty – and landed in what for him became the ideal video perch: TYT, an Internet show that allowed him to say exactly what he wanted on any topic that engaged him. That freedom proved a heady brew not just for him but for YouTube viewers who, struck by the show’s honesty and lack of constraint, kept coming back in larger and larger numbers. Since its launch a decade ago, TYT has had over two billion hits. But with success came a fork in the path. Uygur’s renown meant that he was offered gigs on MSNBC and Al Gore’s Current TV. The latter seems to have been a happy alliance, but it ended when Gore sold the network to Al-Jazeera English. The former is a more interesting story. Uygur seems to have done a good job substituting for various MSNBC hosts, but after he finally landed the coveted 6pm slot for himself, the network pulled him. The reason, he believes, is that he was too hard on President Obama. Fox News belongs to the Republican Party and MSNBC to the Democrats, he says, which is why you so seldom hear genuinely progressive critiques of the latter: corporate media simply do not allow truly independent voices. Uygur, who is seen taking part in the Occupy Wall Street demonstrations of a couple of years back, makes a good case that Internet news and opinion outlets are filling a need that old media, unfortunately, simply can’t. Whether that means the truths they speak to power will eventually make a difference – Uygur says government officials “don’t give a crap” – remains to be seen. But his pioneering efforts certainly remind us how controlled most “news” in this country is, and how much alternatives to them are needed.